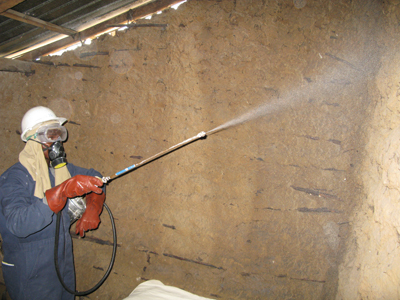 Insecticides are fundamental to vector control programs for vector borne diseases. Malaria is one of the most dangerous of these diseases, with an estimated 627,000 deaths per year. Reducing transmission by targeting mosquito populations is an integral strategy for controlling this disease. Such programs are heavily reliant on the use of insecticides- in the form of Insecticide Treated bed Nets (ITNS) and Indoor Residual Spraying (IRS)- to decrease mosquito populations and so lower transmission of the disease. The widespread use of insecticides has inevitably led to insecticide resistance in mosquito populations worldwide, but particularly in Africa. It is unclear how resistance directly affects malaria transmission, but it has, for example, been shown to affect vectorial capacity in An. gambiae. Resistance can arise by a variety of mechanisms, based on either an increase in metabolism of the insecticide or a reduction in the levels of insecticide reaching the target site. Changes in the porosity or thickness of the mosquito’s cuticle fall into the latter category, as do behavioural changes that may result in avoidance of physical contact with the insecticide. These mechanisms are well understood, but comparatively rare compared to the incidence of molecular mechanisms of resistance. The two most common mechanisms of resistance are target site resistance and metabolic resistance. Resistance to insecticides such as pyrethroids and DDT, which target the insect’s nervous system, can occur through mutations in the sodium channels. This is called target site resistance or knock-down resistance (kdr) and is the best understood of all of the various mechanisms of resistance. Metabolic resistance, on the other hand, is a result of insecticide sequestration or detoxification before it reaches its target site. Many genes in the cytochrome P450 family of enzymes have been found to play a role in metabolic pyrethroid resistance. An increase in glutathione S-transferase (GST) activity has also been associated with resistance to all 4 classes of insecticide– organophosphates, carbamates, pyrethroids and DDT. A member of the GST family, GSTe2, has previously been shown to exhibit high levels of DDT dehydrochlorinase activity – a mechanism of detoxifying the insecticide which thus confers DDT resistance. The use of DDT in the field has been discouraged because of its persistence in the environment and so a majority of current ITNs and IRS are formulated using pyrethroids. However, where resistance to pyrethroids is evident, DDT is commonly used as a long-lasting, cost-effective alternative. Unfortunately, there is increasing evidence of cross resistance to both DDT and pyrethroids. A study just published showed over-expression of GSTe2 was sufficient to confer DDT resistance in transgenic Drosophila. This new study identified a single amino acid change L119F in GSTe2 that confers DDT resistance in An.funestus. Riveron et al (2014) carried out a comprehensive study of this molecular marker, investigating the prevalence of the genotype and characterising the mechanism. They surveyed populations of Anopheles funestus from Benin, where DDT resistance is widespread, and compared them to DDT-susceptible mosquitoes from other countries in Africa with moderate to low/no DDT resistance. They found that GSTe2 is the most over-expressed detoxification gene in the DDT and permethrin resistant mosquitoes and the L119F mutation was tightly associated with metabolic resistance. Further structural examination revealed an enlarged DDT- binding cavity in resistant alleles that allows increased access of the insecticide DDT and hence metabolism. Finally, genotype mapping revealed that there is a strong correlation between the geographical distribution of the genotype and patterns of DDT resistance across Africa. Accordingly, they developed a diagnostic Taqman assay for the early detection of DDT resistance in the field. Given the strong directional selection for GSTe2 in resistant populations and the minimal gene flow observed between African regions, the authors propose that this assay will be useful in the prediction of the future spread of this resistance. Dr Charles Wondji at the Liverpool School of Tropical Medicine says “The detection of molecular marker such as L119F in GSTe2 could help policy makers make evidence-based decisions for the design and implementation of vector-control programs, to help save time, money and ultimately- lives.” Improper usage of insecticides can drive resistance and so better designed control programs could minimise the levels of resistance arising in the field. In the near future his research team hopes to identify similar molecular markers for other classes of insecticide and to further simplify the Taqman assay to make it more accessible to anyone hoping to use it in the field. He also emphasises the importance of open-access publishing, so that such useful findings are shared for the greater good of designing better control programs.